I travelled to Berlin early November. It has been on my must-visit list for a while, its decisive history being one of the appealing aspects of the city. Next to that I really wanted to check why everyone is so excited about Berlin, calling it Europe’s hippest and most trendy place to hang out. However much I realize ‘hip’ is ultimately undefinable, I really wanted to go and see for myself. I travelled by car as all cheap plane tickets were gone by the time I finally booked a hotel. Despite the heavy construction work the trip was not too bad, I took the fast lane on the A2 motorway which took me right into the city center. My hotel was located in Friedrichstrasse, Berlin Mitte, the heart of the capital and a very lively neighbourhood with several places to eat and drink. 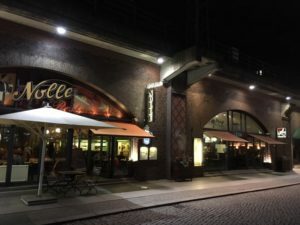 It was pretty close to the train station and the old railway arches have been filled up with many restaurants. I had a nice meal in restaurant Nolle, I ordered a very reasonably priced house dish: schnitzel, sausage and meatballs. This is Germany after all. Late at night, I walked up to the Brandenburg Gate for the first time, it would not be the last time. Somehow I felt drawn to this monument, as if I forced myself to think and rethink the value of freedom and peace. 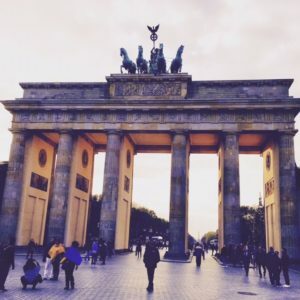 Its surrounding Pariser Platz is a quiet cobblestoned pedestrian zone, they banned traffic from the square which allows people to come together and reminisce about the time when thousands celebrated the fall of the Berlin wall back in November 1989. A lot of embassies, like the American and French, are located nearby, as if to make every visitor recognize their share of peacemaking at the time. Close to the Brandenburg Gate is the Reichstag, seat of the German parliament, and the Holocaust Monument, a memorial for the murdered Jews of Europe. Both are equally impressive be it for different reasons. The next day started grey and cloudy. I walked the entire 3,3km long Friedrichstrasse up to Checkpoint Charlie, an important former crossing point between East and West Berlin but actually looking rather fake. The outdoor photo gallery with many pictures and stories about daring escapes during the Cold War was of much more value to me than the replica of the border house with guards posing for pictures with tourists. I decided to walk around the Eastern part of Berlin, passed the red-brick Berlin City hall and headed all the way up to Alexander Platz. In the end, walking is essentially what you do when city tripping, right? 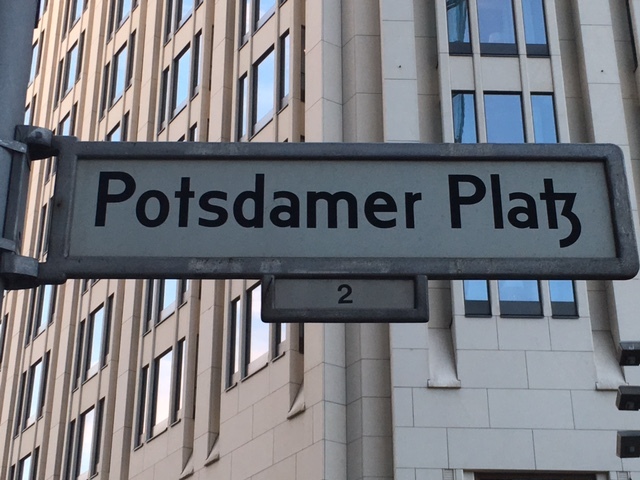 Alexander Platz did not make too much of an impression on me. It is Berlin’s largest public square featuring mostly shops and a TV tower which is a great orientation point and undoubtedly provides most splendid but greatly overpriced views over the city. Walking through the Museum island and along the magnificent Unter den linden Boulevard left me utterly amazed. Great buildings and world-renowned museums line up alongside each other. Too bad the weather was dark and gloomy and renovation as well as construction work was going on all over the place. This really blurred the pretty view and definitely prevents every tourist from taking nice pictures. This by the way applies to the whole of Berlin, I have never seen so many cranes per square km anywhere else. Late afternoon I hung out in the area of the Potsdammer Platz, and had a beer in the Sony Centre, masterpiece of innovative architecture and modern technology. 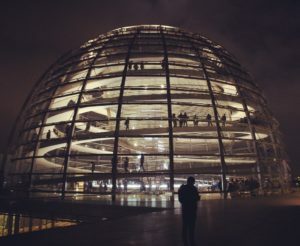 To finish the long day, I signed up for a visit of the Reichstag roof terrace and glass Dom which gives fascinating views of the city and the Brandenburg Gate in particular. It also provides insight in the Bundestag plenary chamber featuring the purple seats and the large eagle as symbol of the Federal German republic. After a good night’s sleep and a very rich breakfast I decided to explore the outskirts of the city by public transport instead of by foot. My feet were killing me actually. Tempelhof in the south is interesting, for the mere fact that this vast piece of land so far has not been commercially developed. Instead people in Berlin come together here for hanging out. Must be fun in summer, not so much in winter. 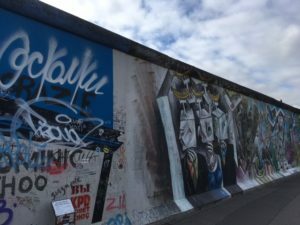 I took the metro line and stopped at Warschauer Strasse to see the remainder of the wall at East side Gallery, which does give you a good impression of what it looked and felt like at the time. Walking around Friedrichshain, I tried very hard to feel the attraction. The many restaurants and abundance of street art gives the area a bohemian atmosphere. I can imagine, in summertime, this is a place you would want to spend your long evenings. In wintertime though this is a raw and somewhat gloomy area, even threatening at some point. Freedom is taken to the outer limit, drinking happens out in the open, on the street. I had a burger in Burgeramt, by the amount of people inside, it must have been the best burger in town although I suspect at least some people primarily want to be seen eating there. Berlin left me with mixed feelings. It is a magnificent city, full of history you cannot ignore. Buildings and monuments are screaming for attention. You have seen many sites in documentaries on TV, about Hitler or the war. Walking passed these icons of history so many decades later makes you feel quite overwhelmed. But Berlin definitely wants to outgrow its history and be a contemporary, arty hotspot for next generations who will be less interested in its past. I can see the potential but I will need to come back when all work in progress has finished and I have to change the season so I can stroll the many parks and squares and enjoy the ultimate – and mostly fairly cheap – outdoor food and drink experience. I’ll be back. I have a link with Haiti. 21 years ago I spent a few weeks in the country, after being invited by Jan Hoet who has lived, and devoted much of his life, in support of the country and it’s people. I spent most of my time there in the capital city of Port-au-Prince but also went into the heart of the country, Mobin Crochu, which left me quite overwhelmed. Getting there first of all but also witnessing local living and working conditions was a total shock to a young, white, privileged woman at the age of 23. When I returned I wrote a thesis on the subject of US interventions towards Latin America, focusing mainly on Haiti. For quite some years now I have a foster son in Haiti, through Cunina, which is what I consider to be my small contribution to at least one young human being’s future. That is how connected we are, Haiti and me. At least that is what I thought. Watching a program about Haiti on Belgian National Television recently made me realize I am still greatly touched by what is going on there, and more specifically what is not going on there. In the course of these 21 years the country has seen political turmoil, hurricanes and 2 earthquakes. Through all sorts of aid and relief programs, money was transferred to rebuild the devastated homes and infrastructure. Based on what I saw on television the country is still in the exact same dreary situation like it was 21 years ago. Buildings were constructed and went down again, similar to governments and economy. People in Haiti are not worried about climate change or rising populism and couldn’t care less about international Women’s day. They want to survive and they dream about a better life, a better world is too far out of reach. They are not used to turning to either government or neighbours to solve their problems, they will try to fix things themselves. Only God and the lottery can be of useful assistance. They live in the moment – mindful as we would say – not caring about what comes the day after. Give them a dollar and they spend it. People were constantly approaching me and touching my white skin when I was walking the streets of Port-au-Prince. They wanted money “Hé Blanc, give me one dollar” and by looking at them I could see they assumed I had plenty of it. Little did they know about my life and financial situation as a student but insignificant were my issues as a student compared to their everyday struggles. It made me feel uncomfortable, I felt threatened and misunderstood. I was not there to enjoy a cheap vacation, I was there to figure out and appreciate Haiti but they couldn’t be bothered about that. I was also appalled by the tons of dirt and litter I saw and stepped on throughout the entire city. But mostly it was the stomach-upsetting smell which was horrendous. I can still recall the smell and how if left me nauseous. In the heartland there was a completely different vibe. But first we had to get there. We had to cover 150km to Mobin Crochu which took us 2 days. We started off on a paved road, heading all the way up to Cap-Haitiën in the North of the country. We drove along the beautiful coastline, with white sandy beaches and no-one on it. On our way we had to deal with holes in the tarmac, trees in the middle of the road, and car wrecks – or rather bus wrecks – blocking our way. I was wondering about the death toll on this road but didn’t pop the question for fear of knowing the answer. From Cap-Haitïen to Mobin Crochu was a bumpy off-road ride which did cause some uneasiness and bruises. We arrived in the tiny village featuring some houses, a school, a hospital and a church. The place looked desolate but peaceful. People were away working on the fields or selling whatever the fields gave back. Children were playing. The atmosphere was less hostile, probably because they were used to seeing strange Belgian people around. I talked with the locals, played volleyball, had a drink, bought some of their local ‘art’ and went to church. I saw people living a simple life, without too much hardship and more closely together. Numerous blows and setbacks have forced the people in Haiti to adopt a survival mode and to focus on the short term. Despite heavy fund raising through numerous NGOs – no other country has more NGO organisations per capita as Haiti – there still is no infrastructure or solid democracy, despite heavy but not exactly altruistic promotion by the US government over the past decades. I ended my trip 21 years ago with a dinner on the shady terrace of the Grand Hotel Oloffson, a French Victorian-style hotel in the middle of Port-au-Prince but completely hidden away in a quite street. it was a magical place, like a sanctuary in the middle of complete and utter chaos. The hotel is famous as it was the inspiration for Graham Greene’s novel the Comedians. It is also a known place for journalists and writers to come together at the most critical times in Haitian history. I felt greatly inspired when I was there at the time and was glad to see that the hotel is still operational and reservations are welcome. Not on Booking.com though but hey, this is Haiti ! There is no better way to escape the infinite sadness of Winter than to go skiing. The snow lightens up all darkness and you spend your days outside. No need to make sophisticated travel preparations or plans, you just pack your ski stuff and every morning you know you will be doing nothing but skiing, eating and drinking. Pure joy ! 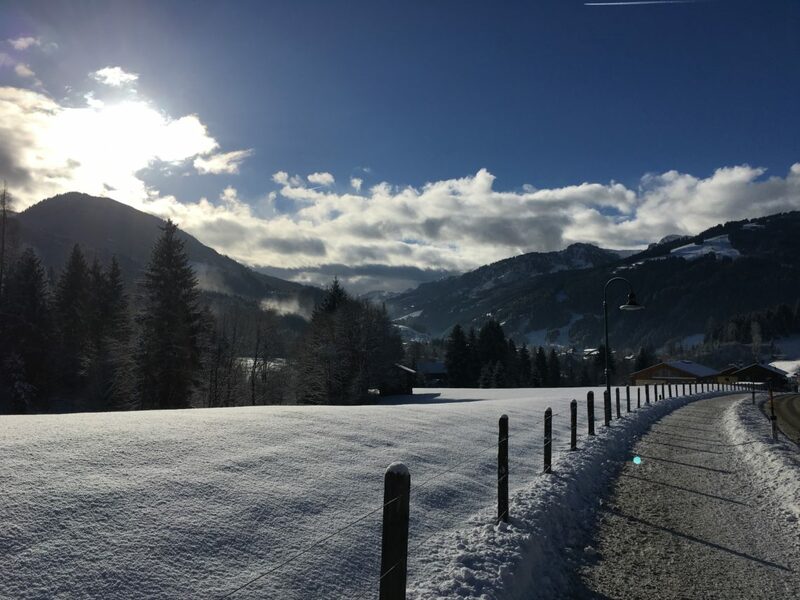 For the second year I stayed in Wagrain, Austria and enjoyed the Ski-amadé resort, a large network combining 28 ski areas and towns. The ski resort was named after the composer Wolfgang Amadeus Mozart. This year we were literally bombarded with snow. It’s so delightful to plough through it in the morning to get to the skilift, so different from your regular mornings when you just step in your car and drive to work. 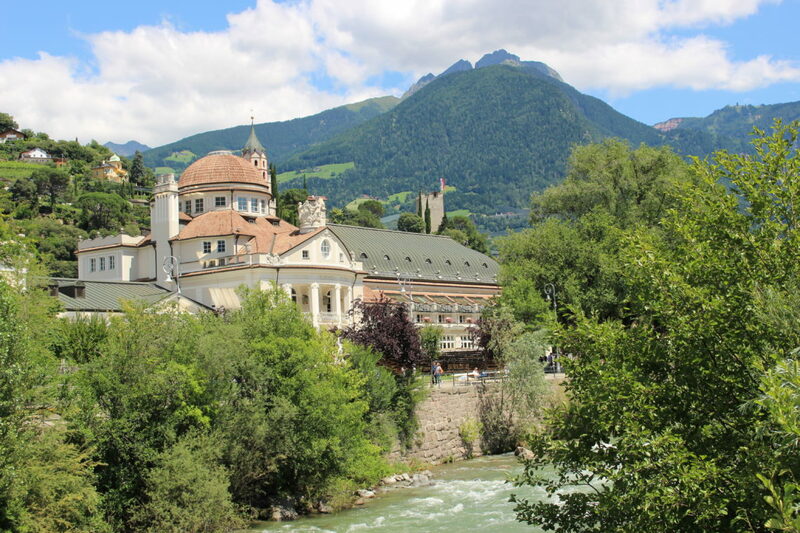 By the way, did you know that Wagrain is the original home of Atomic Skis ? The greatest thing I bought was an espresso machine. I’m addicted to coffee so I consider this to be a vitally important object. Got rid of my piano as I will never be any good at playing the damned thing. The best music I heard on stage was Tame Impala at Werchter, a bunch of Australian weirdos producing instant feel-good music ! I was mostly, and most unexpectedly, charmed by Lake Garda in Italy, never been there before as I’m not very fond of mass tourism but it was truly a nice experience. My best move was to finally start writing and start preparing for a serious career switch. 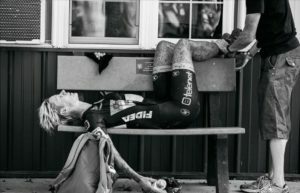 I mostly admired my sister, again, she is just amazing the way she rides her cyclocross bike each week. Best citytrip was Barcelona, where I spent most of the time on the beach or drinking cava without ending up financially ruined. Best fun was the skitrip in December with my dear friends which left me financially broke though and physically exhausted. Greatest loss to me was George Michael, my teenage hero, my pop idol. Best quote : ‘I’m nicer when I like my outfit’. Best lesson learned, from my 11-year old son : to be a good mother is to be a laughing mother. Okay… Mostly appalled by terrorist actions all over Europe, creating fear and uneasiness whenever you are surrounded by people. Looking forward to 2017 with great expectations ! Hope to see Oasis reunited and play at some Belgian festival soon. Want to spend some time in Winchester, England in July to celebrate the 200th anniversary of Jane Austen. Aspire to reread all here great classics by then. 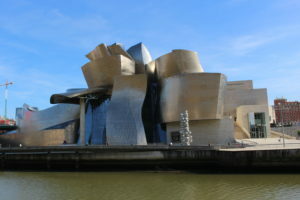 Want to go on a city trip to Bilbao, Spain and Aarhus, Denmark. Want to watch the second series of The Crown on Netflix. Intend to have my house and garden fixed after all these years. Hope to realise this career switch and enjoy my job. Watch Delvis and Radiohead at Belgian Summer festivals. Get rid of the couch which is destroying my back with every minute I spend on it. 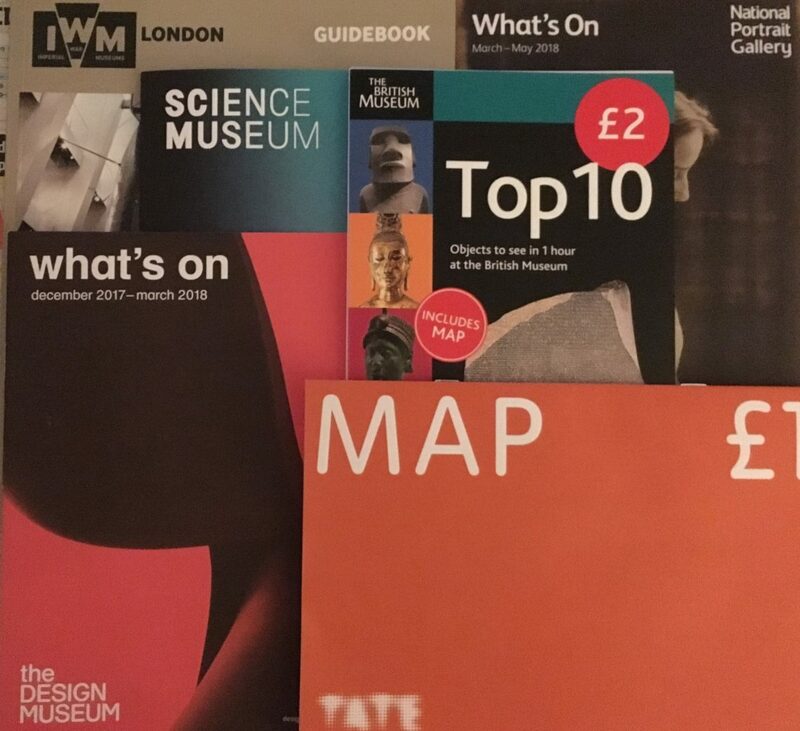 Plan to get out more, visit places and exhibitions. Plan to invite more people…if I manage to get my house and garden fixed…Okay. Barcelona is on everyone’s list of been-there’s or must-see’s. It’s no surprise. This is a tremendously diverse and bustling city where you need to go to without a plan and just hang around. Options are numerous, the atmosphere is great and so is the weather. There is only one downside: slowly this city is getting overwhelmed by tourists which is annoying many local residents. Also you need to prebook all the famous hotspots you want to visit if you don’t want to spend the whole day lining up. I decided to take my chances and went without a pre-fixed schedule. Barcelona is Gaudí, there is no way to be or remain ignorant of this fact. When checking in at the hotel, the man at the reception gave me a city map with the Gaudí sites already marked as if that was the only purpose for my trip. Even if you are not into culture or architecture you will be amazed by his work, mostly by the creative and imaginative character of it. He designed buildings, sculptures and gardens in a modernist style, combining Catalan patriotic tradition with innovative technical solutions. The genius of Gaudí is mostly expressed by his masterpiece the Sagrada Familia. Even unfinished, this church – as technically speaking it is not a cathedral – is a stunning piece of work. Although somewhat spaceship-like and seemingly made of sand, you need to take your time and watch the tons of symbolism. Casa Batlló ‘House of Bones’ is another one of Gaudí’s unique works. It is a fairytale building with lots of colours and a facade with skeletal shapes. Casa Milà was Gaudí’s last civil work in which he tried to recreate natural flows with bricks and mortar. It looks like a building creeping around a corner. Both Casa Batlló and Casa Milà are situated on Passeig de Gràcia, a glamorous avenue in the city centre. Besides these famous houses and the many exclusive shops, you should definitely look up to spot the other stunning pieces of modernist architecture. The benches and lampposts are wonderful, they are called benches-lamps as they are actually one and the same artistic element. According to National Geographic, Barcelona is the number one beach city, leaving Cape Town and Honolulu in second and third place. The white-sand beaches are close to the city centre and are easily accessible. On a hot day you can mix a city break with a sandy break and have a cool drink in one of the many beach bars and clubs. 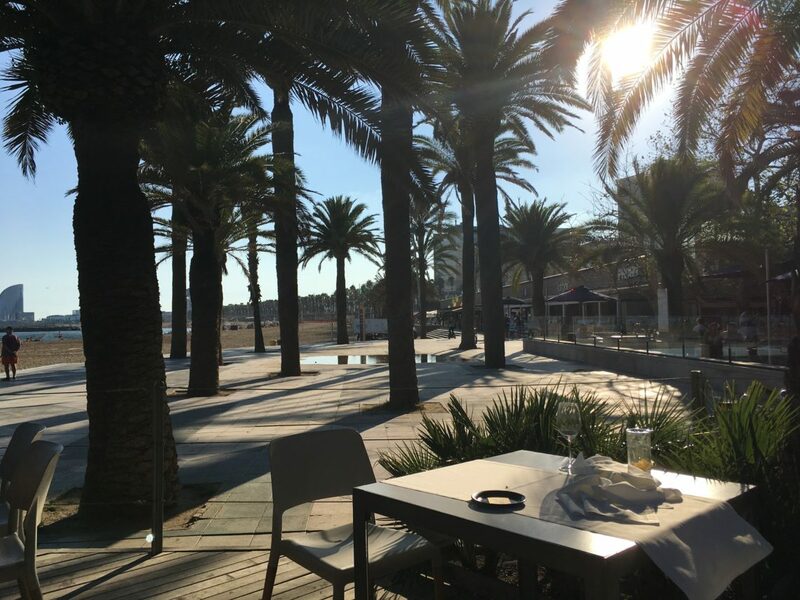 I did some serious beach bumming on Barceloneta beach, one of the oldest and most popular beaches, located in the traditional fishing district. 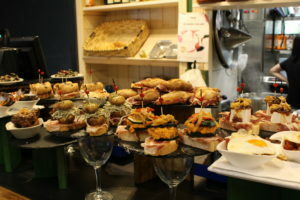 Although tapas are meant as small portions of food, served in between meals and to go with some wine or beer, restaurants will serve them all day as this is what most tourists expect. The best tapas are often served standing in a crowdy bar. It takes some courage not to feel intimidated and to go straight up to the bar and order your portion of tapas. Often they are displayed in glass cabinets so just pointing at what you want will also do. 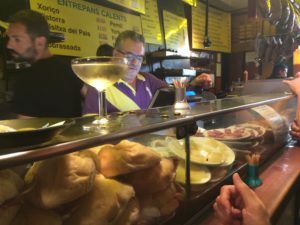 Whilst eating tapas you can sip a glass of cava or vermouth. 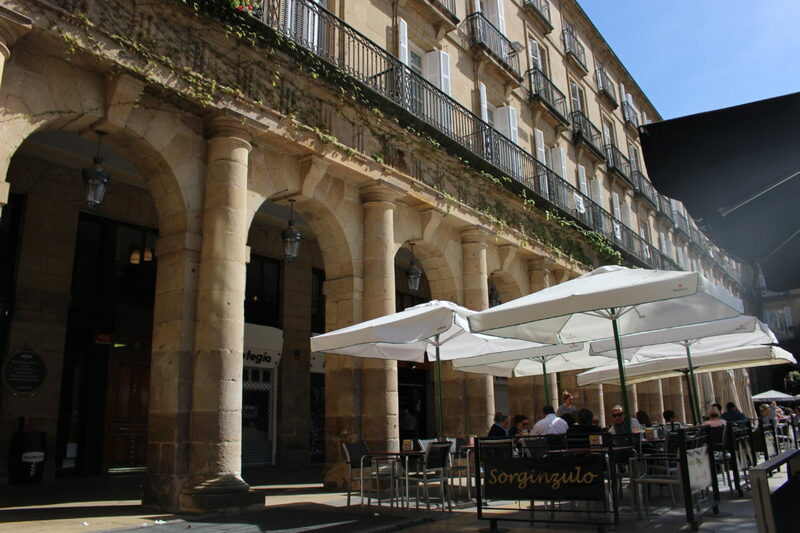 On a sunny afternoon I ended up at La Champagneria Cava Bar. I nearly missed it as it is really tucked away in an anonymous side street. It is a great place to have a cheap overfilled glass of cava and a greasy pork sandwich. It’s not top-healthy stuff but it tastes good. Although very well known and busy it still has a magnificent authenticity. It is loud, messy but brilliant. To avoid people getting too drunk they have a rule that says you need to order food to go with your cava. Hilarious ! Maybe it’s because of the crowds but I was not so much enchanted by the Ramblas Promenade. It is the number one attraction in Barcelona, a pedestrian tree-lined boulevard cutting right through the heart of the city. Being too much of a tourist magnet for me I quickly left the main street for the Gothic Quarter. This is a lively district with small streets and nice squares, from the tiny Plaça del Pi to the Plaça Reial, a pretty arcaded square with palmtrees. Barcelona is a city you will end up visiting more than once. At least that’s how it feels for me. Spending a few days here does not require a huge travel budget. I will be back and I will behave like a good tourist, spending my money on a nice hotel rather than renting a local flat or staying at some Airbnb, to make sure they still want me there. And perhaps next time I will make these reservations upfront to visit more of Gaudi’s work. I visited Barcelona in September 2016.